Drawing on a rich archive of Spanish, Arabic, French, and Catalan sourcesincluding literature, historiography, journalism, political speeches, schoolbooks, tourist brochures, and visual artsCalderwood reconstructs the varied political career of convivencia and al-Andalus, showing how shared pasts become raw material for divergent contemporary ideologies, including Spanish fascism and Moroccan nationalism. Colonial al-Andalus exposes the limits of simplistic oppositions between European and Arab, Christian and Muslim, that shape current debates about European colonialism. 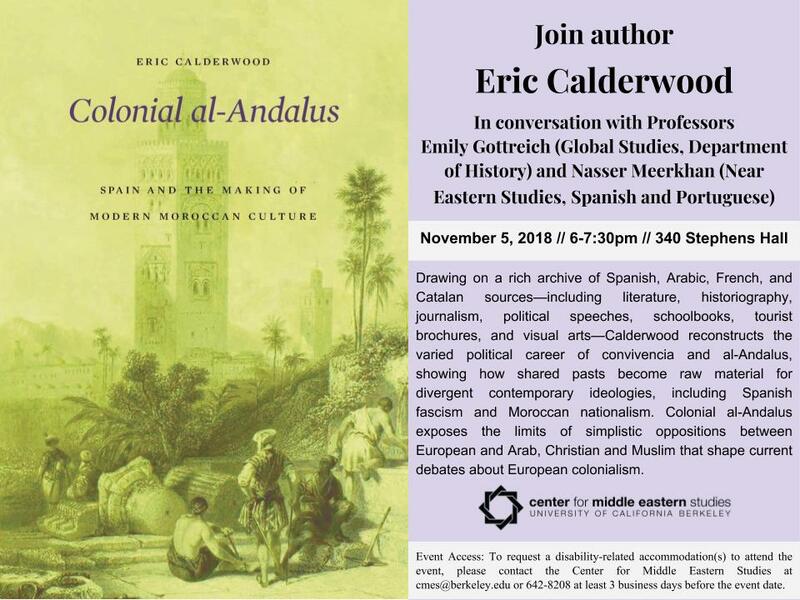 Eric Calderwood is Associate Professor in the Program in Comparative and World Literature and Director of Graduate Studies at the University of Illinois at Urbana-Champaign. Recent publications include Colonial al-Andalus: Spain and the Making of Modern Moroccan Culture (The Belknap Press of Harvard University Press, 2018) and The Invention of al-Andalus: Uses of the Past in Contemporary Mediterranean Culture (book manuscript in progress). Dr. Calderwood received his Ph.D. from Harvard University.